The last leg of my trip was spent in Romania, the place of my birth whose name alone triggers a unique vibration for me. For personal reasons (which I'll reserve for later posts), the trip has been full of very intense emotional experiences, and as much as I find them taxing not least because I love living and experiencing the world feelingly, I always find myself looking back with nostalgia for the place, in my heart, that is "my Romania". I credit my own upbringing in Romania for the passion that I have been cultivating for books, in general, and for reading. And this post is most appropriate to pay tribute to the objects in our lives that invite us to discover places and people of far-away lands without leaving the comfort of our own home. I am definitely one of the folks who not only take refuge in the comfort of a book, but also use every opportunity to savour books published in Romanian (as an intimate part of the culture, the language is for all of us the most readily available mechanism that allows us to feel connected to our culture - and that couldn't be more true in my case). "Bibliotèque" ("Library") depicts the treasures that we all strive to acquire in our attempt to quench the curiosity that takes hold of us from the earliest age. 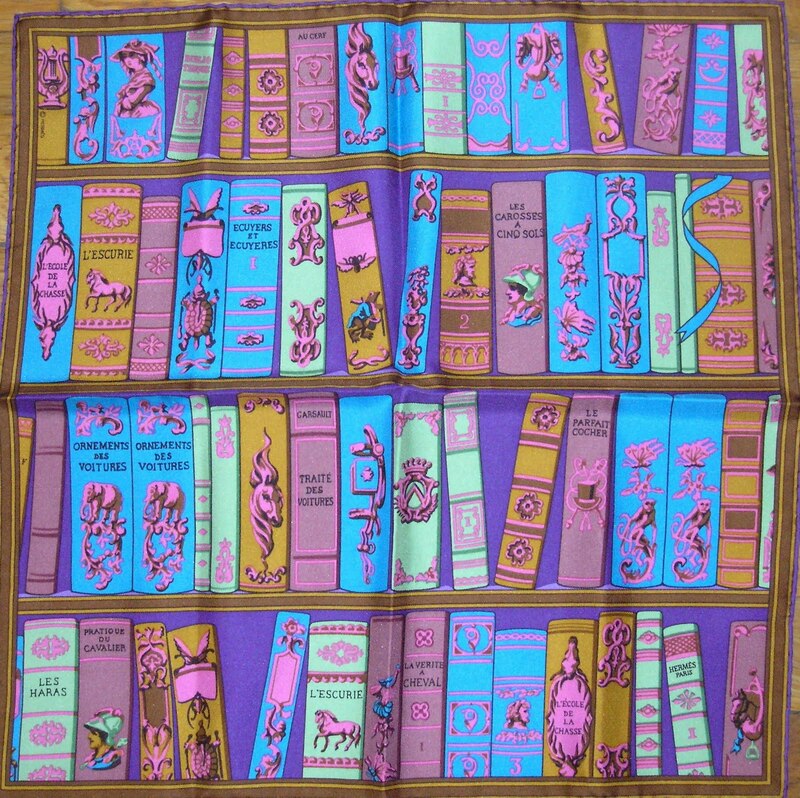 A stunning design where the pattern of select books, suggestive of covers of glorious stories, are harmoniously matched with colours that stir the viewer. 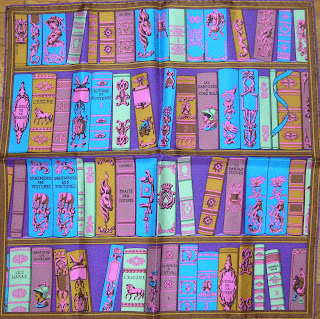 My passions for books and impeccable silk fabrics are perfectly matched in this design. So I bid you farewell until next week, for I must hurry to shop for some new titles, which I'm only too eager to add to my own personal "biblioteque". As I embark on a trip that will enable me to explore, admire and fall in love with Venice, I thought it perfectly fitting to live the excitement of experiencing the glory of "La Serenissima" ("the most serene", the name conferred onto the Republic of Venice) through the very design that Hermes chose in paying tribute to the city built in the middle of the sea. 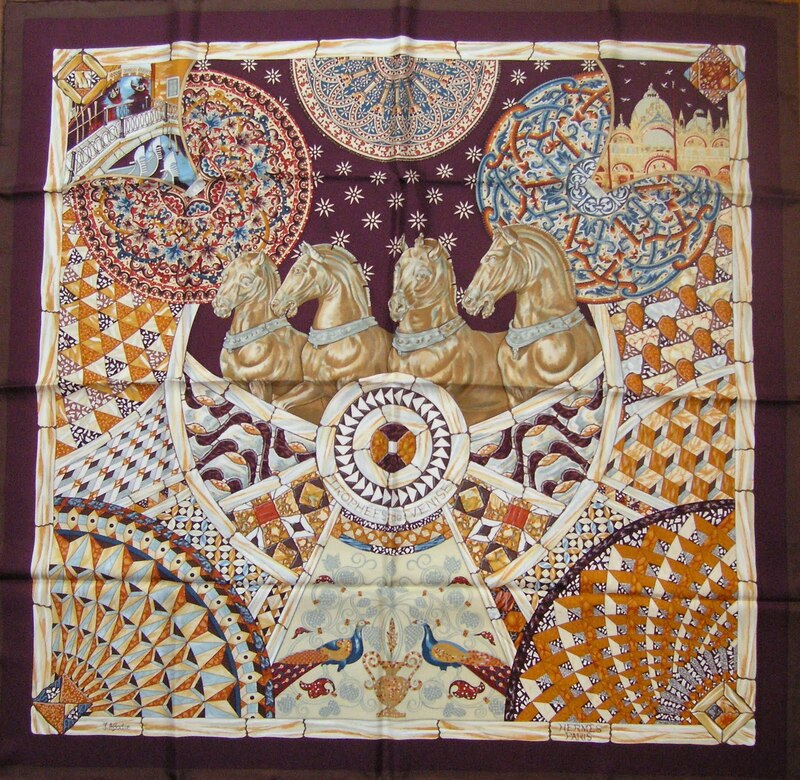 "Trophées de Venise" ("Trophies of Venice") is an ode to the cultural richness offered uniquely by Venice, as the focal point of this design - the four horses depicted from an angle slightly to the right of the ensemble - makes obvious. 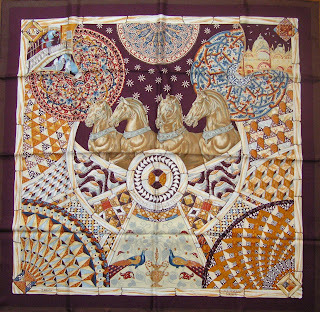 The illustration is a direct reference to the Triumphal Quadriga, the bronze horses adorning the façade of St. Mark's basilica since the thirteen century (previously, they had crowned - appropriately - the Hippodrome of Constantinople until the city fell, during the Fourth Crusade of 1204, to the Christian armies; the Venetian troops were quick to "rescue" them by bringing them back to Venice; there was a further hiatus in their presence in St. Mark's square, thanks to Napoleon's wish to place them on the "Arc de Triomphe du Carrousel"; the originals have since been returned to Venice, where the exact replicas continue to look over St. Mark's square while the originals can be admired inside). The corners above the horse ensemble depict further highly recognizable elements of Venice - St. Mark's basilica, with its eclectic architectural motifs, and two of the ubiquitous bridges across the lagoon canals, underneath which you recognize the gondola heads (whose iron, used to gain stability by counter-balancing the gondolier's weight, is a mini-map of Venice: the six strips called "pettini" (comb) represent the six "sestieri" (quarters); an additional long strip represents Giudecca Island; the double "S" bending represents the Grand Canal; on top is a stylized dogal horn and, under that, a lunette representing the Rialto bridge). All around the apparent circles are illustrations of the domes found in the churches of Venice. Finally, the two peacocks placed in the middle of the lower half of the design are a direct reference to the byzantine art, ever so present in the Venice's architectural gems. Within the spiritual teachings of Christianity, they symbolize resurrection, renewal and immortality. Needless to say that I'm thrilled to have the chance and opportunity to re-live the experiences I've been deriving from my readings on Venice, in real life. Ahead of my upcoming trip to Europe, I have been imagining the places to check out and the activities to fill my time with, and during this exercise in day-dreaming, I recalled another voyage of discovery to a place far-far away that succeeded to enchant me beyond my wildest expectations from the first moment I set foot in the airport. If you thought of my time abroad in 2007, you guessed correctly that I was referring to Japan, a land whose people (and beauty) marked me for life and continues to inspire me to this day. During my time there, Hermes had launched "Carnets de bal" ("Dance Cards"), a design representative of the beautiful Art Nouveau movement. 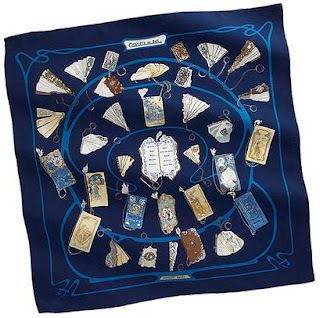 Dance cards, at their peak in the 18th century, served to remind society ladies the order of the dances they were to perform, along with the names of their partners (interestingly, mend eventually adopted them as well). As this design illustrates, dance cards evolved to elaborate "objets d'art", highly decorative objects often ornate with precious materials (silver, gold, ivory or pearls) and jewels. The contour of the "frame" onto which the dance cards are displayed reminds me of the Parisian "Metro" entrances of yesteryears, designed by Hector Guimard, that added even further to the metropolis' charm. 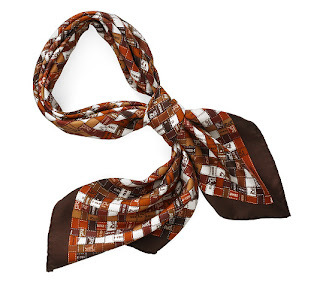 This design manages to appeal to younger and more matures audiences alike, as it maintains its unique femininity both when displayed and when knotted. 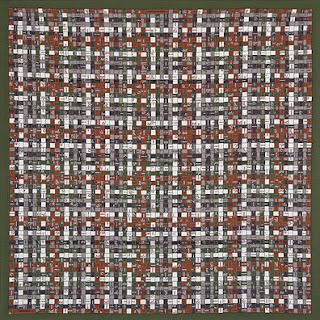 And one of my personal favourites, particularly since I associate this beautiful design with a place that I found most beloved ! A model from the FW2007, "Bolduc au Carré" ("Ribbon Squared") is simply charming. 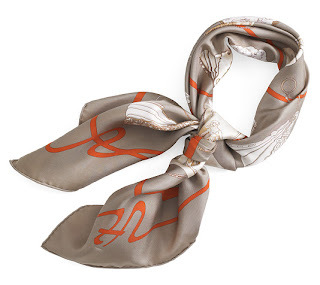 The scarf design pays tribute to one of the subtle yet iconic elements of the Maison, the thin ribbon used to wrap the gift boxes. 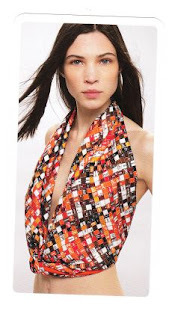 The design illustrates a pattern of different coloured-ribbons, harmoniously weaved into a "cloth". 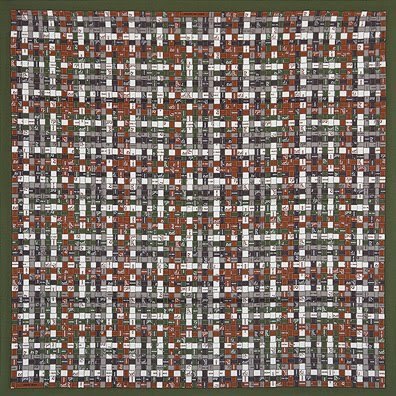 It's an impactful design, perhaps a little mature in the colours that I featured, but definitely young in some more vibrant colours, as issued by the House since 2007, in both traditional silk scarves and cashmere/silk shawls. A truly timeless design !